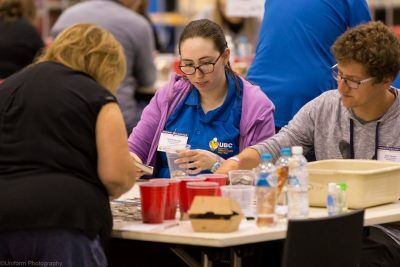 Have you ever been curious what goes into the preparations of Good Friday Appeal? How do we achieve the results we do year after year and who helped us with achieving it? Well, here are just some of what goes on and we are delighted to share it with you. The pre planning process involves getting the permits for our volunteers to collect on the ‘streets’. 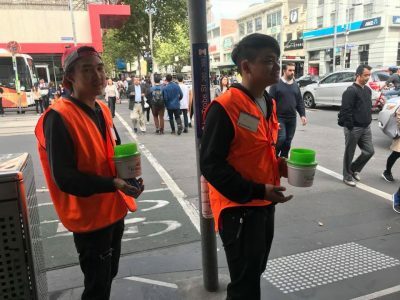 These are actually various corners and intersections around Victoria where our volunteers collect from. 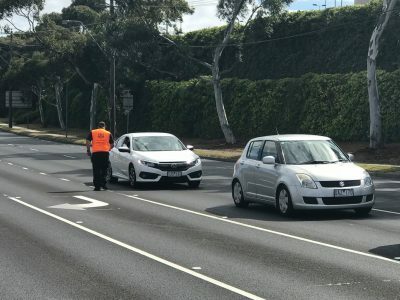 You may have seen them with their tins on GFA day while you are strolling the streets, or perhaps while in your car when stopped at a red light. Permits are sought from various channels, and safety for our volunteers is always top priority hence why there are rules and regulations in place. 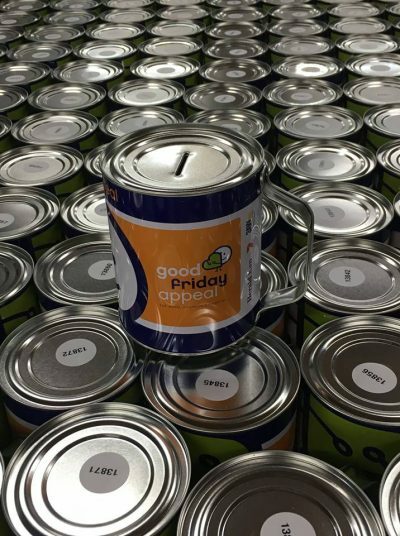 Another pre planning process is getting the tubs and tins ready for distribution to all the different ‘outlets’ that collects for Good Friday Appeal. 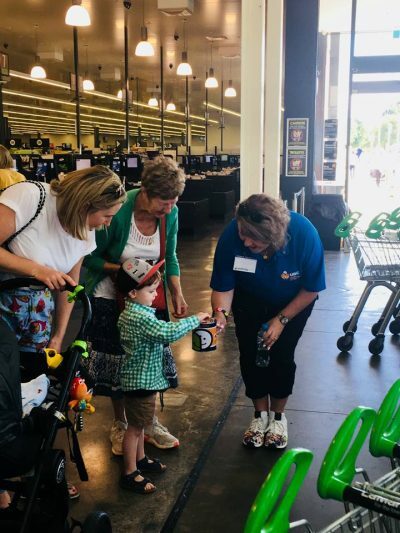 These outlets are our corporate partners – 7-11, MFB, CFA and LaManna supermarket, together with our dedicated Branches and Groups across Victoria. 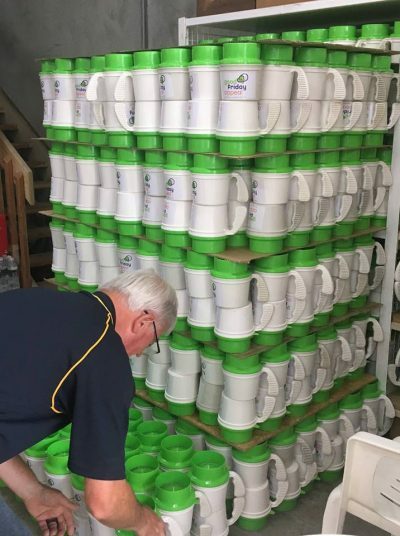 These tubs and tins are prepared at our head office and then distributed to the outlets, along with other needs to them. 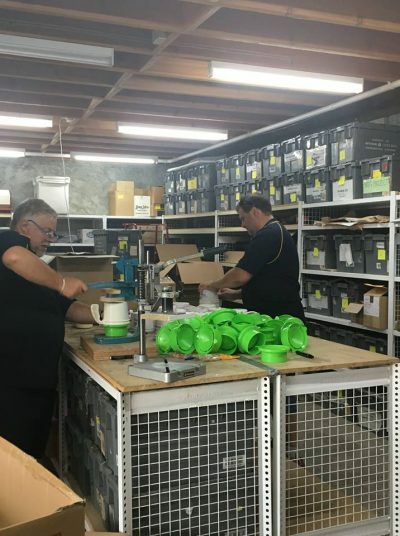 Pre GFA day – placing lids on tubs. 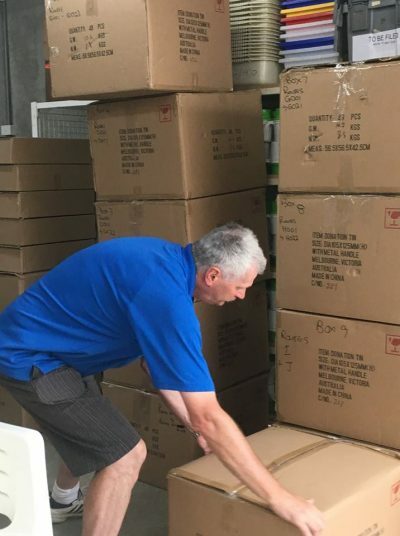 Tubs in boxes ready to be distributed to outlets. Quite a lot of activities goes on weeks prior to Good Friday Appeal. 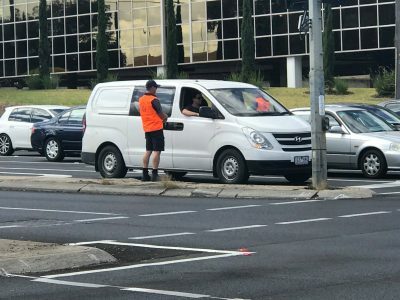 Such are collections at LaManna supermarket, collections at Jackson Court and Tunstall Square at Doncaster East and we also had the help of students and teachers from Ozford College who collected for us at Melbourne Streets. 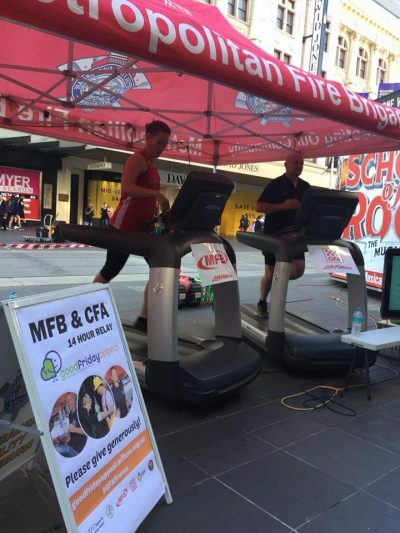 Our partners, MFB and CFA had their 6th 14 hour treadmill relay challenge and in addition to that, our Branches and Group across Victoria had Raffle outside Coles and Woolworths. 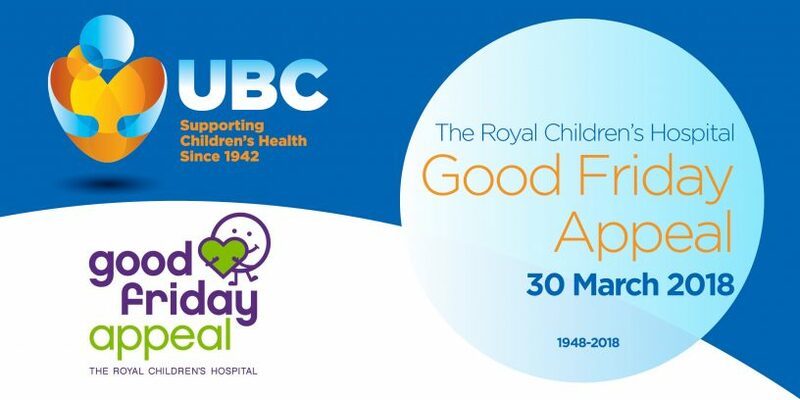 All the money collected from these various activities goes towards the money raised for Good Friday Appeal. Our partners, MFB and CFA, 14 hour relay challenge. 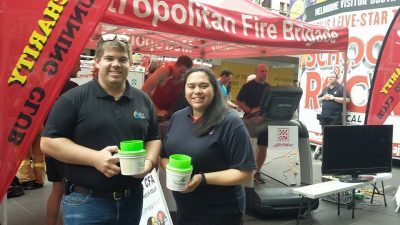 Our partners, MFB and CFA 14 hour relay challenge. 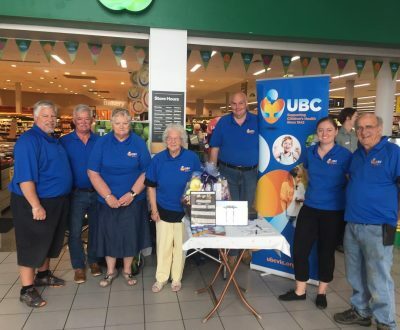 Ozford College volunteers collecting for us prior to Good Friday Appeal day. 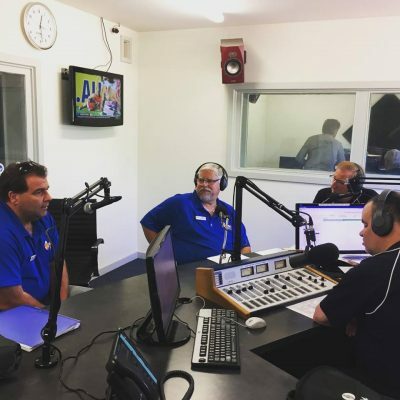 Publicity is necessary to remind and inform the public of our existence and the cause we are supporting hence we are thankful our President Paul Etherington had the opportunity to appear on Channel 7, Radio Port Philip and also to 3AW for helping our Club gain the needed publicity. 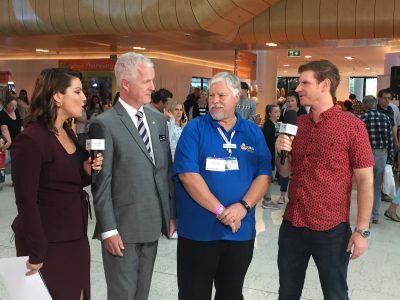 Our President Paul Etherington, along with Grand Master of Freemasons Victoria Keith Murray, with Channel 7. Our President Paul President Paul Etherington and our partner MFB Ross Smith, at Radio Port Philip. Our historic Wheelbarrow push started off at Sorrento making its 29km way to Dromana with Clem Kleinig and the Peninsula volunteers, our Branches and Group doing their collections on the streets and door knocks in the regional areas, our team in the counting room at Melbourne Convention and Exhibition Centre busy the whole day counting money from tubs that came back from the metropolitan areas, our much loved Bob Bunyip making his round at the Kids Day out area to entertain the kids. 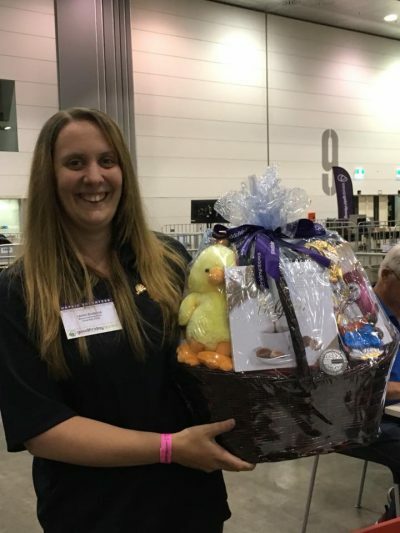 LOTS happen on the day itself and it ended with the drawing of the Raffle (chocolate hampers galore!) and the 2018 cheque presentation to the Good Friday Appeal organisation. 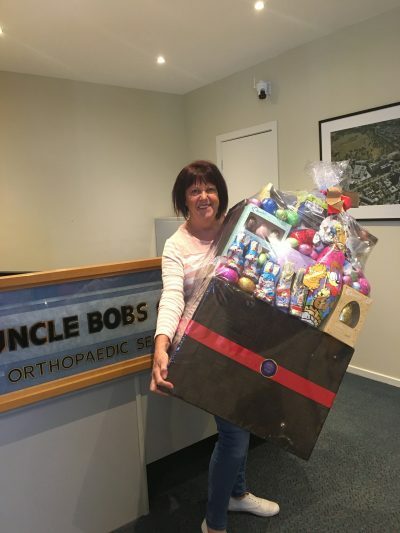 Raffle winner Karen has been doing the Good Friday Appeal with UBC for 6 years. Thank you for your support Karen! 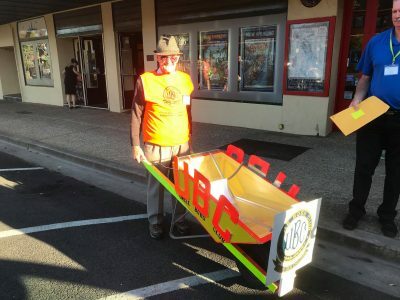 Clem Kleinig has been doing the Wheelbarrow push for 50 years, thank you Clem! 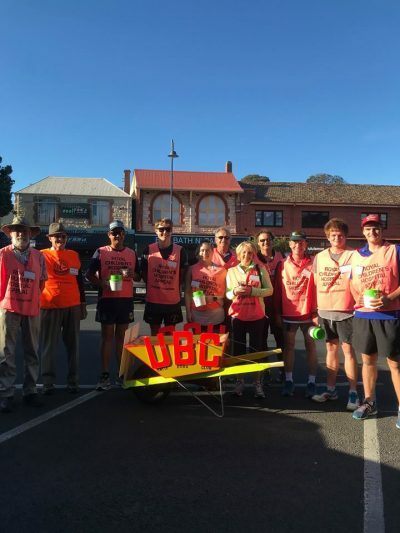 Our historic Wheelbarrow push with Peninsula volunteers. 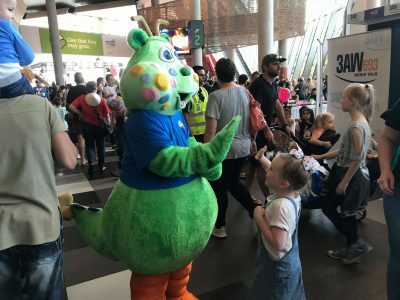 Collections on Good Friday Appeal day. Raffle winner. Thank you for your support! Counting, counting and more counting! Tubs coming back to counting room being sorted. Our much loved Bob Bunyip. 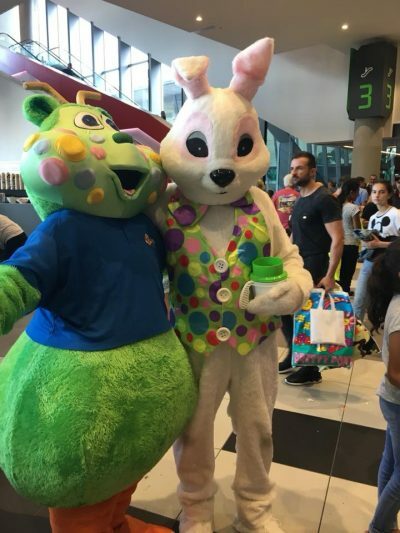 Our Bob Bunyip with the Easter Bunny. 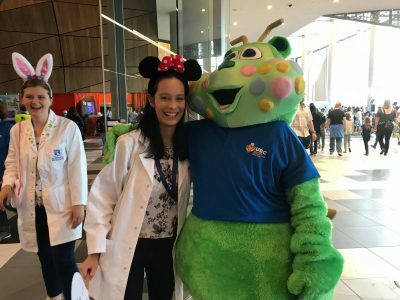 Our much loved Bob Bunyip! 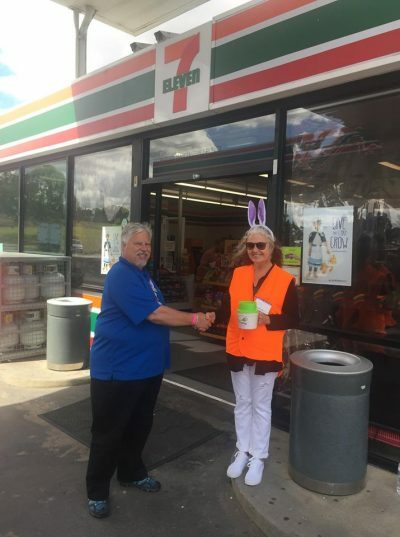 Julie, legal secretary with 7-Eleven , collecting on GFA day. Thank you 7-Eleven for the 10 year partnership!